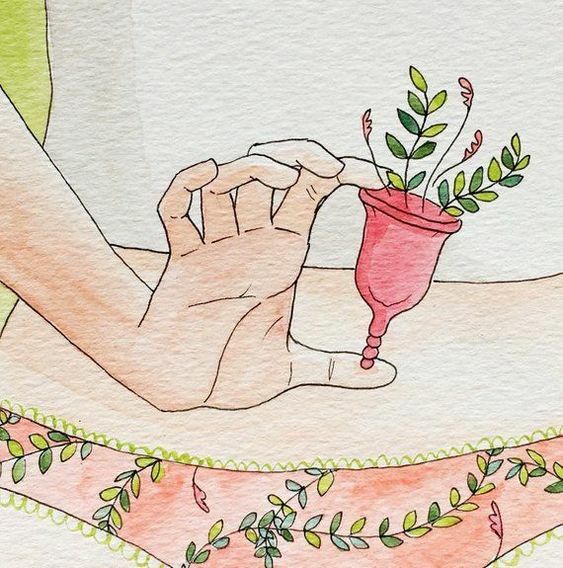 It was in conversation with Richa that I first considered using menstrual cups. I had seen the ads for cups on an online page where I track my period way back in 2005 and checked with the local pharmacy and was told that they are not available in India. I heard about them again when Richa was telling me to make a switch last year. I don’t do anything without first doing tonnes of research. So I promptly went online and googled for menstrual cups and was flooded with information. There is loads of information out there from the correct way to use them, to the side effects (UTIs if you don’t clean them well and a very minute chance of Toxic Shock Syndrome) and countless user reviews. I also checked with a gynaecologist friend who told me to go for it as long as I wash it after every use. I ordered my menstrual cup online. It is available in 3 sizes depending on your age and whether you have had children. For the uninitiated, a menstrual cup is a small silicone cup shaped almost like a wine glass. It has a cup body and a stem. Inserting the cup sounds more difficult than it actually is. I usually sit on the pot. I sometimes raise my legs on a trash can to make it easier. The cup is malleable and I fold it in half and push it in. It goes in easily especially if your legs are raised. There a countless articles available online which explain it better than I can. To remove it, I just pinch the base so that the suction breaks and the pull it out. It comes out easily. I usually empty the cup into the loo, wash it with warm water and mild soap and insert it back again. It is that easy. You can wear it while running, sleeping and even while swimming. I have fairly heavy bleeding the first couple and at its worst the cup will last for about 4 hours before it needs to be emptied. I started using the cup for the environment. The pictures and figures of sanitary pads accumulating appalled me. However I continue using it because of the ease of use. It is very convenient. The biggest advantage as far as I am concerned is that you don’t feel it is there. You feel nothing after inserting it. You can put it in, and go about your business without worrying about leaks or any of the discomfort associated with pads. I can’t recommend it enough! Rebecca is a counsellor and works primarily with children and adolescents. She loves travelling, reading and food. She made the switch about a year and a half ago and says that she did it for the environment.